In 1929, Chicago newspaper magnate Walter Strong built a castle that inspired the imagination of his family for the next 30-plus years. Today, it remains a bastion of renewal and personal growth that’s enjoyed by more than 12,000 people annually. Stronghold Castle, lit up at sunset. Since he finished the first grade in 2000, Andrew Busker has spent every summer at Stronghold Center, in Oregon, Ill. The 18-year-old Rockford resident has stayed in rustic cabins tucked deep into the woods. He’s traveled through the camp’s adventure courses and worked on his Eagle Scout project there. For the past few summers, though, he’s lived at this camp’s towering focal point: a summer home that everyone knows as “the castle.” It has a five-story tower, a knight’s armor displayed by the door, tapestries hanging on the walls and, yes, secret passageways. Long before it welcomed summer campers and winter retreaters, the castle was home to the family of Chicago newspaper publisher Walter Strong, who built it in 1929. For 30 years, his family spent summers relaxing and playing inside the castle and throughout its wooded acres. Owned today by the Blackhawk Presbytery of the Presbyterian Church (USA), this unusual place continues to reflect Strong’s investment in family and imagination. There’s still something special here. Though it’s called a castle, the structure reflects a combination of European manor house, Tudor styling and Depression-era construction. The castle complex consists of three buildings and has 22 rooms, including 19 bedrooms, 11 bathrooms and several secret passageways. At every turn, it encourages the imagination. The castle cost $80,000 when it went up during 1929. Although its age shows, the creaky wooden floors and cracking plaster only add to its ambiance. Even when it was new, the castle was crafted to appear as though it had stood for centuries. Carpenters used the same technique on the home’s 10 fireplaces and fireplace hoods, which are blackened from smoke. Each fireplace was built from limestone quarried on the property. There’s more limestone in the five-story tower, which is reached by a spiral staircase. Each step is anchored by reinforcing rods, stuck deep into the rounded concrete walls. Climb those winding steps and you’ll see the story of “Rumpelstiltskin” illustrated on the walls. Atop a narrow stone staircase stands the impish fairytale character. The character and the mural were painted by a Russian artist in the 1930s. Figures within the painting are said to resemble both the family and the artist. Another staircase inside this room leads to an observation deck. Far below, the glassy Rock River and winding Illinois Route 2 appear to be miniatures. On a clear winter day, Lorado Taft’s Black Hawk statue is sometimes visible as well. “They tell us that in the 1940s, you could see Black Hawk, but there are too many big trees now,” says Hartman. A surprisingly scant amount of personal information about the Strong family was left to historians, even though Walter Strong was an important newspaper magnate. Locally, most information about the family and its castle is anecdotal, relayed by various colorful relatives. Strong made his wealth through the now-defunct Chicago Daily News, which was then at the top of its game. According to Strong’s biography on file at Chicago’s Newberry Library, he grew up as an orphan, lived at Chicago’s YMCA and worked odd jobs at the Chicago Daily News, where his uncle, Victor Lawson, was publisher. Lawson had no children of his own and became a reluctant and distant father figure, supporting Strong financially, at arm’s length. Following high school, Strong worked odd jobs while studying at a series of colleges, including Beloit College. In 1913, Strong married Josephine Webster, daughter of a Chicago tycoon. They had five children together: Walter Jr., Jonathan, Robert, Anne and David. While raising his family in Winnetka, Ill., on Chicago’s North Shore, Strong rose through the ranks, first as his uncle’s personal secretary and later as the newspaper’s business manager. He purchased the newspaper following Lawson’s death in 1925. As he amassed his fortune, Strong began constructing a summer home near Oregon for his growing family. He bought his first 60 acres from Wallace Heckman, a prominent Chicago lawyer whose estate across the river hosted the eccentric Eagle’s Nest Art Colony (read more about Heckman’s estate in NWQ’s Spring 2011 edition). Strong’s summer home was just south of Bee Tree Farm, where wife Josephine’s large family often summered. Josephine’s brother, Maurice Webster, designed the castle, which was inspired by Strong’s visits to European castles. Some say it was also influenced by the wild estate of another newspaper baron – William Randolph Hearst. Whereas Hearst Castle is opulent, Stronghold is more rustic and straightforward, with a decidedly Depression-era sensibility and Windy City practicality. Walter and Josephine dedicated their new home during Thanksgiving 1929. According to accounts held by the Ogle County Historical Society, the party was lavish, with many of Chicago’s elite in attendance. The family of seven, with their two dogs, spent its first summer in the castle in 1930, when the children ranged in age from 4 to 14. Sadly, it was the only one the entire family would share. In May 1931, at just 47 years old, Walter Strong suffered a fatal heart attack. All historical accounts describe Strong as a dedicated family man who enjoyed providing his children with the kind of education and nurturing atmosphere that his own childhood lacked. Many things around the castle, including light fixtures in the front hall and dining room, and an ancient toboggan tower, were built by the Strong boys. The entire structure seems geared to awaken a child’s sense of mystery. The children’s playroom, for example, is connected to one of the home’s many secret passageways, where entrances are hidden behind bookshelves and inside of utility closets. A secret chapel is hidden behind library walls. Even the family’s massive oak dining table – measuring 20 by 6 feet and weighing half a ton – was crafted for the family. After Walter’s death, Josephine and her children returned to the castle every summer for nearly 30 years. Over time it became a place for Strong’s children to have fun with their own children. The family threw wild costume parties and welcomed many guests to the estate. In fact, the family loved costume parties so much that it’s often difficult to date family photos because their costumes represented different time periods. Though it was always a place for fun, the summer retreat was also a place of beauty and spiritual respite. Today, the summer camp at Walter Strong’s former home is a favorite getaway for both youngsters and adults. Beauty, imagination and laughter are still in strong supply. 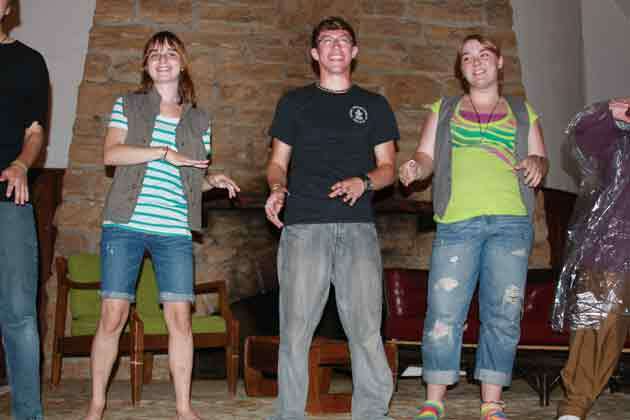 In this retreat center, family is held in high esteem, just as it was in Strong’s day. 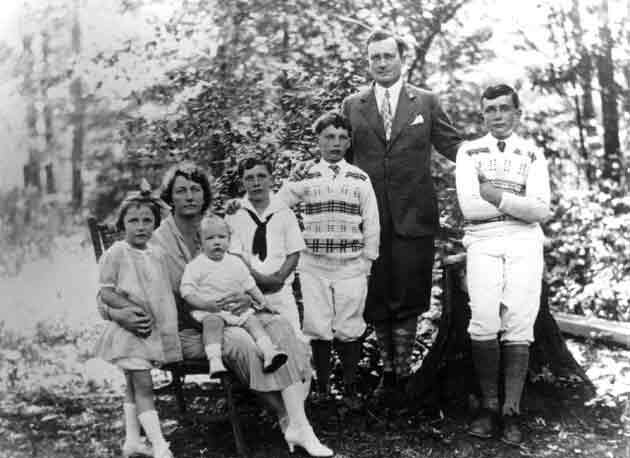 After Josephine died in 1961, the Strongs sold the estate to a Presbyterian camping group for $125,000. In the summer of 1963, the new Stronghold camp opened the castle and its grounds to nearly 100 wide-eyed youths. Today, under ownership of the Blackhawk Presbytery of the Presbyterian Church (USA), it serves more than 12,000 visitors each year who represent many interests and faith backgrounds. Over the years, it became impossible for all visitors to dine at the Strong table and sleep in castle bedrooms. A 360-acre campground has developed, with a variety of lodging options, meeting spaces and outdoor amenities. 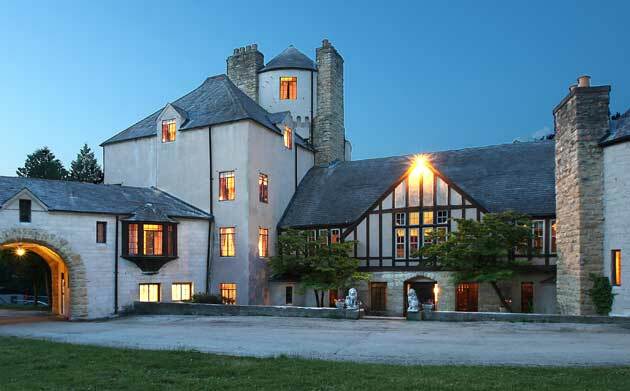 In summertime, it accommodates nearly 230 people; younger campers rough it in rustic cabins, while older ones stay at modern facilities or inside the castle, which sleeps 56. In winter, the camp hosts up to 180 guests. Outside, visitors can explore a variety of settings. Youngsters learn about the natural world in the woods, or in the quarry where limestone was harvested to build the castle. High above the tree canopy is a ropes challenge course; camp facilitators host teambuilding activities there and at other special courses scattered around the woods. A modern mess hall hosts up to 200 diners, or can be used for worship services and other large gatherings. During the first week of October, Stronghold Center transports itself back in time to the Tudor era, inviting the general public to an Olde English Faire on its lawns. Colorful performers in period costume wander about, knights in armor battle in competition and costumed craftspeople display their wares. This year’s event is Oct. 1 & 2, coinciding with Oregon’s annual Autumn on Parade festival. 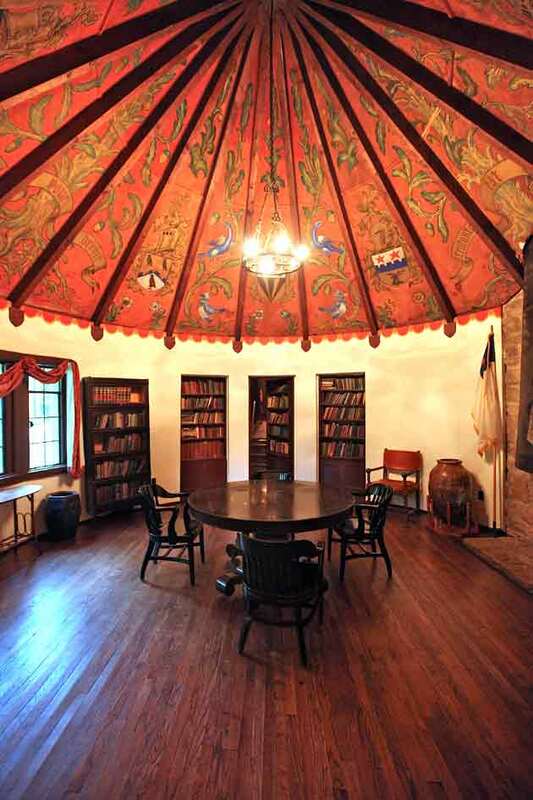 Stronghold’s owner, the Blackhawk Presbytery, is an association of 79 Presbyterian churches stretching from the Mississippi to Northwest Chicagoland, and from the Wisconsin state line to Peoria, Bloomington and Champaign. The center hosts church-related meetings, and individual church groups can host their own retreats. In this way, the campground lives up to Strong’s desire to nurture future generations. Although it’s operated by Presbyterians, the summer camps and retreats are open to people of all faiths. During summer camps, children are met with a Christian message that’s not specific to one denomination. Before he became program director, Anderson, 32, discovered Stronghold through his church, First Presbyterian in Dixon, Ill. He attended camps through high school, eventually becoming a camp counselor and later accepting a job as assistant program director. Over the years, he’s witnessed the camp’s profound influence on the lives of its guests. Sometimes kids show up reluctantly, then grow so attached that they don’t want to go home. He works with youths from around the Midwest, and nurtures counselors who hail from places near and far, such as South Africa, Germany, Australia and Scotland. Busker is among the youngsters Anderson has nurtured. This is his first summer as a counselor, but hardly his first time at Stronghold. His family discovered it through friends at Third Presbyterian Church in Rockford, and he’s been here every summer since. Busker can remember his favorite counselors and summers spent exploring the castle. Just 5 feet tall, he’s found it easier than some people to find his way around the secret passages. For his Eagle Scout project, Busker constructed a wooden observation deck overlooking the river. Stronghold has not only become his summer home, but also influenced some important decisions, especially as he prepares to begin college this fall. Hartman has heard similar stories from other campers. She knows there’s something special about this place. This entry was posted on Friday, July 15th, 2011 at 12:00 pm	and is filed under Features, Top Posts. You can follow any responses to this entry through the RSS 2.0 feed. Both comments and pings are currently closed.